"Whimsical. Enjoyable. Data-driven." 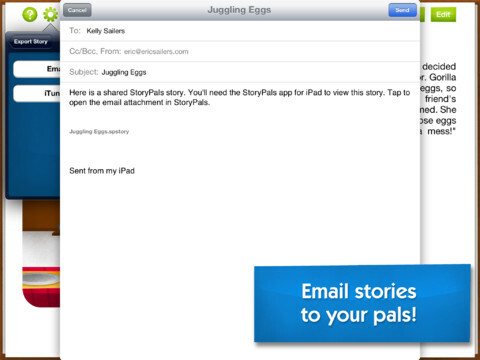 These are the three words that Eric Sailers used to describe his new application, StoryPals. I could not find a better way to start off a review of the application than to use these same words, because I completely agree. To be honest, I have followed Eric Sailers for a while online. He has created/collaborated on many resources for speech-language pathologists, in particular related to technology. One of his most famous creations is the list of applications for iPhone, iPad, and iPod Touch for (Special) Education that he collaborated with others on. It is 36 pages long and was my inspiration for creating my application lists. In fact, I even e-mailed Sailers to ask what his secret was to creating such an amazing resource. Then, he began creating applications himself - ArtixPik, PhonoPix, and Percentally. These applications are to be used in speech-language therapy as a tool to assist in speech and language development. 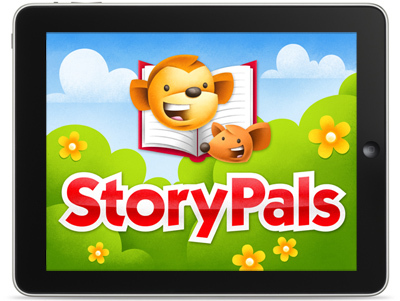 Sailers' newest application is StoryPals, which focuses on reading comprehension. Right when I found out about it, I knew I had to review it, and sure enough, I received an e-mail from Sailers himself! 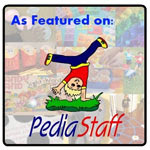 Continue reading for my review of his latest application, StoryPals, and how you can use it in speech-language therapy! Also, make sure you read through to the end to learn how you can download the story "Feeling Green" for your StoryPals application, written by me! The application comes with 24 pre-installed stories. Some of these stories include articulation sounds (such as "Fashionable Fiona" which contains multiple "f" sounds), but the main focus of these stories is reading/listening comprehension. The main page also shows "My Stories" which contain stories that you save with the application or that you have downloaded. Included stories are organized by readability level (2-6) with the lowest at the top to the highest at the bottom. "My Stories" are organized with the most recent at the top. This application is extremely customizable, which is perfect when you work with multiple students. Press the gear button to show the options menu. Choosing this option allows you to export stories you have created by sending them as an e-mail file attachment or to iTunes File Sharing. You can also import stories here that others have created or that you have saved to iTunes. Pressing the "Backup Now" button saves a backup of StoryPals files so that you do not lose them when software is updated. You can restore the app from a backup by pressing the "Restore From Backup" button. Animations - allows you to toggle on and off animations within images. This is a great option to have especially if you have students who are easily distracted. Page Turning - when switching between stories, a page turn animation shows. You can toggle this option on and off. Edit Mode - this will toggle on and off the ability to edit stories when reading them. I recommend turning this option off when a student is using the app. Pressing this button will tell you about the application, the version of the app, the website of the app developer (Eric Sailers), the developer's e-mail, and that the voice is enabled by Acapela. Tapping the "Scores" button on the main page will bring you to the "Scores" menu. All students who have used the application will appear on the left. Select a student to see all of the scores for various stories he or she has taken quizzes on and read on the right. Scroll through the stories by swiping from the bottom up. You can add new profiles in this menu. By tapping "Edit", you can configure students, export scores (to e-mail), or delete them. More information about this feature will be discussed later in the review. Create a new story by pressing the "New Story" button. This feature will be discussed later in the review. You can turn on and off the music on the main page by pressing the microphone button. To start reading a story, choose one from the "Included Stories" or "My Stories" by pressing it. Then, the associated image will appear on the left hand page with the text on the right. Stories vary in length and readability. At the top of each story are multiple buttons for the text to speech. The triangle with a line buttons will navigate backward or forward within the recording. Press the middle triangle button to play the recording/text to speech. Press the middle triangle button to play the recording. Tap the TTS button to flip over the player and play the text to speech. The rate of speech will depend on what you chose in the options menu. If the text is longer than the page, swipe the text up from the bottom to scroll through the story and read more text. The buttons change at the top when flipped over to recorded speech with the buttons skipping back or forward a sentence but the middle button remaining the same. Tapping the Rec button will flip the player over for the voice recording. Tap the red circle button to record your own voice, or a students', and press play to hear the recording played back. They play button can be pressed again to pause the recording or text to speech. In addition, highlighting a word will start the text to speech at the word selected. This is great if there is a word that the student does not know. In regards to the image on the left page, if you chose to have animations enabled within the options, you will be able to press or swipe images to have them animate. If hints are enabled, a pointer will appear showing where to press the image to get the animations to work. Some of the images do not provide animation, some provide only one animation, and others play multiple animations when pressed more than once. Animations often have associated audio as well. 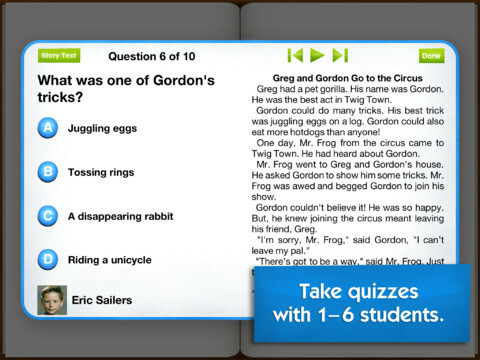 Once the student has finished reading or listening to a story, tap the "Quiz" button to reveal a multiple choice quiz with questions about the story. Make sure to select the students' profile to save the score to. You can then toggle "shuffle questions" to be on or off and select the number of answer choices. To add a new student profile, press "New Student", then add his or her first and last name as well as the type of questions he or she is working on in therapy. Press "Done" once you have filled in all of his or her information. You can also add a picture of the student if you want. If you need to edit a profile, select a student and then press "Edit". You can select up to six students to take a quiz at a time. Select a student by pressing his or her name and a check mark will appear next to it. Then, press the "Begin" button to start the quiz. The quiz will then appear showing the number of total questions at the top and which question the student is currently answering. At the bottom left hand side of the screen, it will show the person whose turn it is to answer the current question. The score associated with that question will be collected on that students' profile. Tapping the "Story Text" button will show the story's text on the right hand side of the page for the student to re-read for answers. Otherwise, the text will not appear. 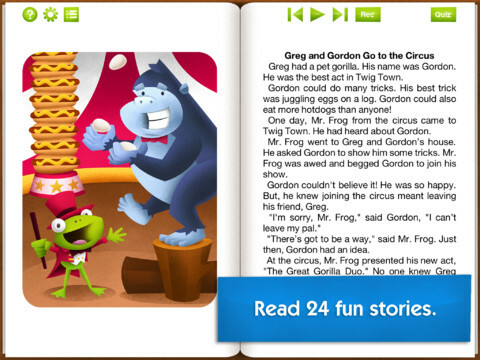 The student can control the part of the story re-read by pressing the arrow and play buttons at the top of the text. The student can have the question read to him or her by pressing the question text. The multiple choice answer chosen will darken in color once pressed and read aloud. Tapping the "Next" button will show if the answer was correct or incorrect by placing a visual thumbs up on the correct answer with audio. The quiz will then advance to the next question and if there is more than one person answering questions, it will chose another student to answer the next question. Once the end of the questions has been reached, you can tap the "Scores" button to see the scores for all of the students taking the quiz. You can tap an individual student to see his or her individual scores on the "WH" questions for the associated story on the left. Notes can be added on a session by pressing the "Notes" button when a student is selected. Tapping "Done" will return you to the story. If you wish to navigate between stories once a student is done with one and wants to begin another, swipe to the left or right at the bottom of a page. Another way to navigate between stories is to press the "Table of Contents" icon to return to the list of stories and select another. To create a story, press the "New Story" button on the main page. Then, tap the "Image" button to choose an image to associate with the text of the story. Choose Illustration Elements - choose from pre-installed images as backgrounds, people, animals, and objects to display in the image. Move them around, resize them, move images to the background, and more within the image. The next step is to add a title and the text of the story. Tap in the "Story Title" box to add text via the keyboard for a title. Then, tap and type your story in the "Enter text for story..." box. You can also choose to duplicate text from a previous story by pressing "Duplicate Story" and choosing from the list of pre-installed stories. Press "Done" to save your story to "My Stories" You can always edit a story later by pressing the "Edit" button. While in "Edit Mode" for your story, press the "Quiz" button. You will then be brought to the Quiz editing page. Write a question associated with your story by tapping the "Enter Question" box and entering a question via the keyboard. Create up to four answers for each question by tapping the "Enter Answer Choice" boxes next to multiple choice letters. Then, tap the box next to "Question Type" to choose the type of "WH" question it is associated with. Finally, choose the correct answer by tapping the associated letter choice. Press "Next" to create another question and "Done" when you are done creating questions. The quiz will then be saved to the associated story once you exit "Edit Mode". The price of this application for what is included in it is perfect. 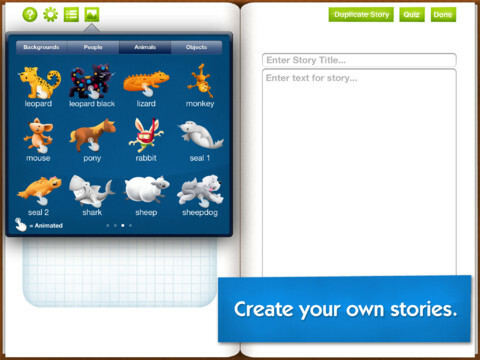 The application includes 24 pre-installed stories with a quiz for each, the ability to create your own stories and quizzes, the ability to download new content/stories from the developer's website, the ability to share your stories with others who own the application, data collection for multiple students, the ability to use the application with groups, working on "WH" questions, and more! There is no other reading comprehension application out there that has this capability! You can use this application in the classroom as well as in therapy sessions to assess reading comprehension. You have the ability to import photos from real life into stories. The application is incredibly customizable to provide the best learning experience and most accurate data collection for your students who have different needs. You can adjust the audio and visuals on the application. Text to speech is already loaded into the application so you do not need to worry about having audio recorded for every story right away. Plus, this allows students to record their own voices and practice articulation skills. It would be fun if there were more images in future updates to use within the application! These could even be added on as in-app purchases. I had a teeny bit of difficulty fitting my text for questions into the quiz box when creating a quiz. It would be nice to either have a character limit shown or the ability to scroll down within a question to read the whole thing. Reading comprehension - have the student read the text and then take the associated quiz. You can choose to show the text again while the student searches for answers or turn off the story from the text while he or she answers questions. Listening comprehension - have the student listen to the text read aloud, read via text to speech, or read via recording on the application. Then, have the student answer the questions without the text shown on the side of the screen to look back on. Articulation/Fluency/Voice - have the student read the text aloud while recording. Then, have the student listen back to his or her recording to determine his or her accuracy of speech sounds/fluency/voice strategies. Vocabulary - have the student read the text and highlight any words he or she does not know. Teach a lesson on these words. You can also read through the story ahead of time and provide vocabulary visual cards to go along with it. Story Sequencing - have the student read or listen to the text of a story and then re-tell the story in order. You can also create your own sequencing cards to have students put events in order with based on the story. Social Stories - create a social story or a problem solving story and have the student read/listen to it. Create questions for the story that relate to solving the problem in the story, emotions, the situation in the story, etc. 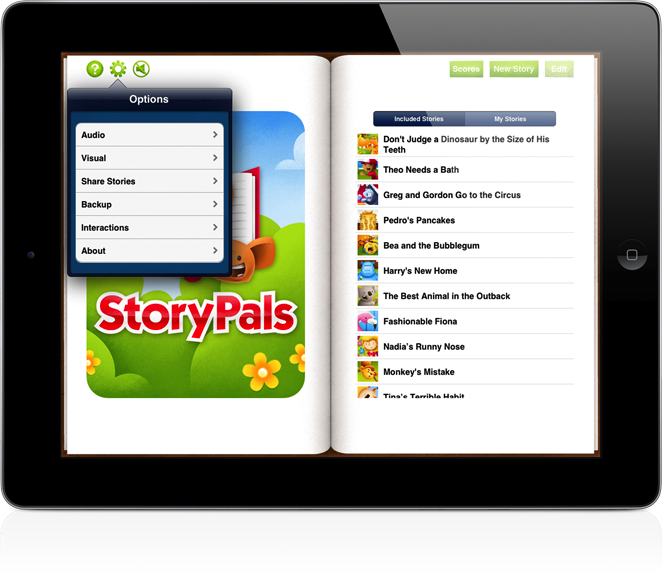 StoryPals is normally $24.99, but you can purchase it for $14.99 through September 8th, 2012 to celebrate back to school! I would highly recommend purchasing it now! 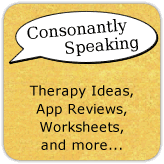 Consonantly Speaking was contacted by Eric Sailers to review the application, however no form of compensation other than placing the "Feeling Green" story created by Consonantly Speaking on his blog was given. You can download the story that I created using the StoryPals application from Eric Sailers' blog. 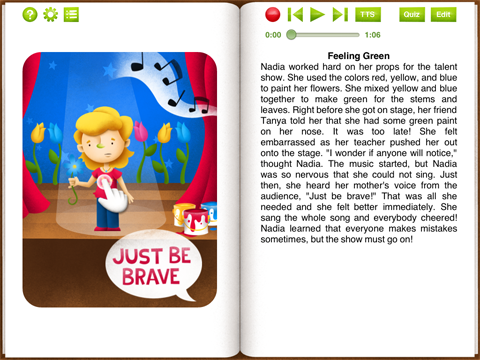 The story is called "Feeling Green" and it is about a girl named Nadia who is singing in a talent show. She accidentally gets green paint on her nose before going on stage, but learns in the end that it's okay to make mistakes! Be sure to pay attention to Eric Sailers' blog and Facebook page as he updates them frequently with new stories to download, written by himself and others, that you can import into the application for free!